Commander Shutz: Strange, and I thought you were an Aryan. A Jewish Barber: No, I’m a vegetarian. If ever a list of the all-time greatest comedians were compiled, Charlie Chaplin would be right up near the top. Chaplin was a master of comedy in the silent film era, but still managed (unlike many of his peers) to carry over successfully into talking pictures. Chaplin’s, The Great Dictator, was faced with opposition even before its 1940 box-office release. It’s not difficult to see why either. The film, at its core, attempts to both satirize and mock the dictators of the time period. It is clear, both in the shocking resemblance and mannerisms of Chaplin, that he is directly targeting Hitler and the Nazis. His dictator character, Adenoid Hynkel, has the same public speaking style as Hitler with his loud, domineering, and even furious rants. Hynkel is the dictator of the made-up country of Tomania and speaks completely nonsensical German (in which can be heard the occasional “wiener schnitzel” or “sauerkraut”) generally when he is speaking to the masses and when he is angry, and speaks English for the remainder: a welcome change as his gibberish becomes somewhat repetitive at times. That being said, many of his longer spouts end in repeated sounds that eventually turn into coughs and sneezes, which, to someone who speaks no German, seems like a spot on mockery of the language. 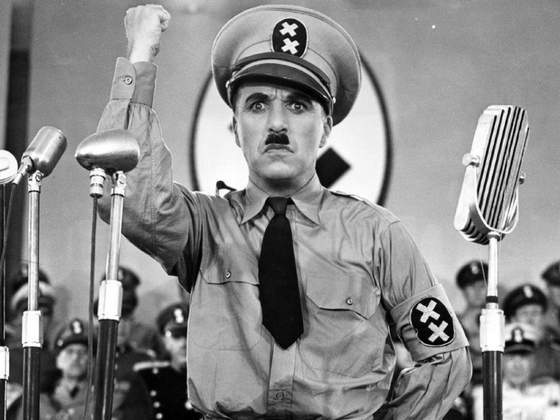 The question that all viewers of The Great Dictator ask themselves at one point or another is, “is it okay to laugh at Hitler?” Chaplin directly addressed this question in his response, “The Comedian Defends His Ending of The Great Dictator,” saying, “As to Hitler being funny, I can only say that if we can’t sometimes laugh at Hitler, then we are further gone than we think. 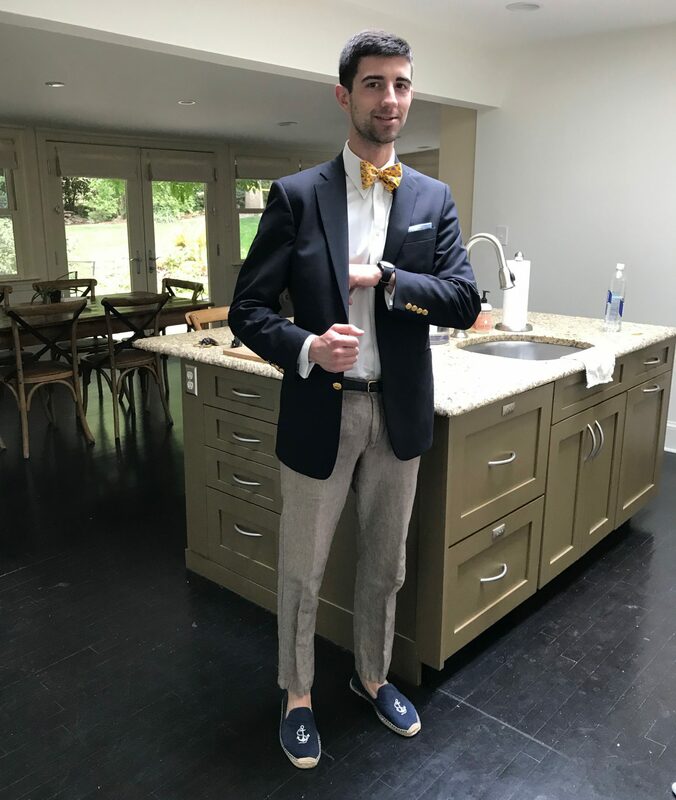 There is a healthy thing in laughter, laughter at the grimmest things in life, laughter at death even.” I think what Chaplin tells us is that as long as we understand who and what Hitler was, we can laugh at him. 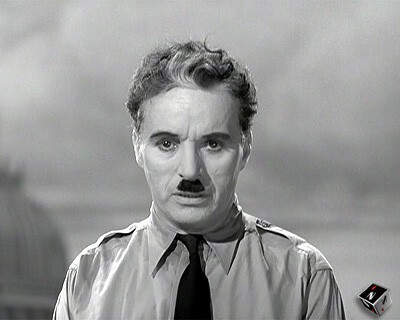 And by “him” I mean Chaplin’s portrayal of him, because in the end that is ultimately what we are laughing at. Americans appeared to accept this as time progressed with Hitler impersonations later becoming a staple of the hit TV show Hogan’s Heroes. This film is unique in many ways, perhaps most prominently in Chaplin’s duel role. Chaplin not only personifies a bumbling version of Hitler, but also plays a Jewish Barber (the name of whom we are never provided). Not giving characters names is a Chaplin trademark. In leaving a character without a name, he effectively allows everyone to relate to him. Certainly he was trying to relate more specifically to Jews in this film, but the Jewish Barber has many elements that are pertinent to all of us (and to those watching the film at the time of its release especially). The barber awakes after being in the hospital for seven years to find Hynkel has overtaken the country. Although it takes a while for him to figure this out. Which, in typical Chaplin fashion, leads to a series of ridiculous encounters between the barber and some storm troopers. The Great Dictator has subtle humorous elements as well. Hynkel’s advisors are named Garbitsch and Herring (takes on the names of Hitler’s high and mighty), and Hynkel is visited in the film by Napaloni: dictator of Bacteria (meant to symbolize Mussolini). The two share numerous hilarious encounters many of which demonstrate the power-driven nature of dictators. Hynkel’s advisors are constantly attempting to create situations in which Napaloni will feel inferior to Hynkel (although almost all of them fail miserably). The film contains many memorable scenes, but two stick out amongst the rest. The first of which (from a chronological standpoint) is the dance routine that Hynkel performs in his office. This scene really lets Chaplin’s genius shine through. He moves effortlessly across the room playing with a giant globe balloon (which eventually pops on him; undoubtedly symbolizing downfall). The other great scene is the final scene. 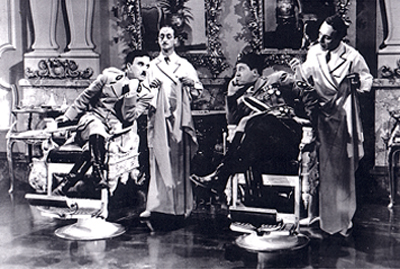 Later in the film, the Jewish Barber is mistaken for Hynkel, and in order to keep his real identity a secret (to avoid being executed as an imposter), the barber must deliver a speech to Hynkel’s troops. The setting is a familiar one to anyone who has ever heard of WWII (which I’m going to assume is everyone… if this isn’t the case, keep it to yourself): thousand upon thousands of soldiers in uniform clinging mindlessly to every word their leader spits out. But the barber instead seizes this moment to both address Hynkel’s followers, and much more importantly, to address those watching the film. Chaplin has his character look directly into the lens of the camera (an act that is usually condemned by those in the film industry). Why? Because when an actor looks into the lens, the space separating the audience from the film disappears; it brings us as viewers into a one-on-one conversation with the actor. Chaplin (and the barber) use this time to set across a stern message of warning against the power of dictators. He urges all to avoid the empty promises and the deceptive tactics of such men. Now, I could go on and on about scenes that I though were hilarious, but seeing them is much more effective. I urge everyone to give this film a view because it is not only funny, but it manages to be funny and still address important political issues. It should be noted that Chaplin did not have full knowledge of the atrocities Hitler was committing at the time. He was said to have remarked that if he knew, he could not have made this film. It is also believed that he was encouraged to proceed with the film by President Roosevelt. 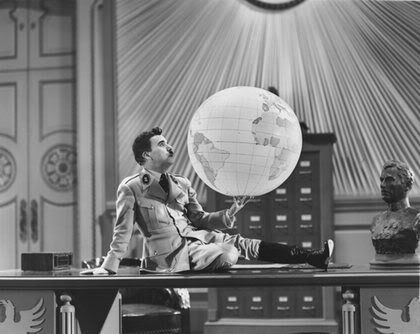 So don’t dismiss The Great Dictator on its premise, just let yourself laugh and enjoy it; it’s OK to.